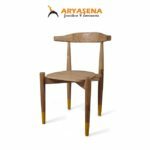 Wooden furniture products, our designers always develop new designs. Using wood which is very abundant in our country and also with the ability of wood craftsmen with extraordinary talent. We try to develop new designs that are completely new, by offering very competitive prices. By continuing to prioritize the elements of art, function and strength or construction in design. Furniture designs like other products such as fashion, will rotate and change continuously and often over and over. So sometimes we design using old designs with a little touch of the present. We also follow the international design trend by looking at various exhibits of furniture products from various parts of the world. From our experience, each country has different tastes. For example, in the United States, Americans prefer colonial designs from the beginning to the present. For Middle Eastern countries, they prefer gold or silver carving designs. For countries in Europe, they prefer a simple design with the use of a slightly curved shape. We also accept custom designs from buyers or can also modify existing designs. This is in accordance with the tastes of the people in each of our buyer countries.